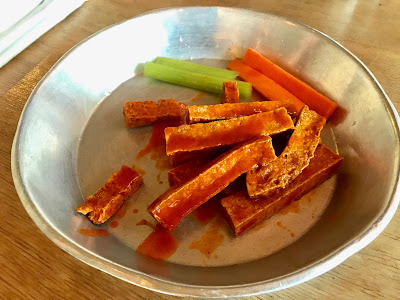 I love Superbowl snacks, and most years, we stay home and eat homemade vegan buffalo wings, chips and dip, and other festive finger foods. But we don’t have cable at home, and finding a way to stream the game online is always a hassle. So this year, we opted to watch the Superbowl at RP Tracks — a college sports bar by the University of Memphis. And our friend Misti joined us! We grabbed a table right by the biggest TV and ordered a couple 22-ounce beers to get started. Paul and I got there early to save the table, but we wanted to wait until game time to order food. So we got an appetizer of Buffalo Tofu to hold us over. These crispy strips are coated in buffalo sauce. They’re really good! That satisfied us over until the game started, but I was pretty hungry by then. Paul and I always split an order of BBQ Tofu Nachos when we go to Tracks. So that’s what we did! Here’s a terrible photo taken after I’d dug in. 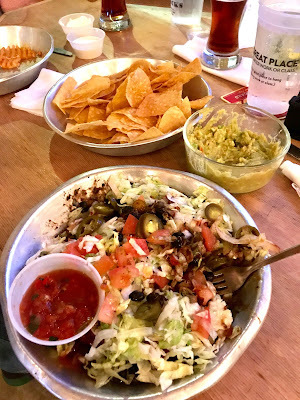 As you can see, we brought our own homemade guac because Tracks doesn’t serve guac anymore (they used to!). 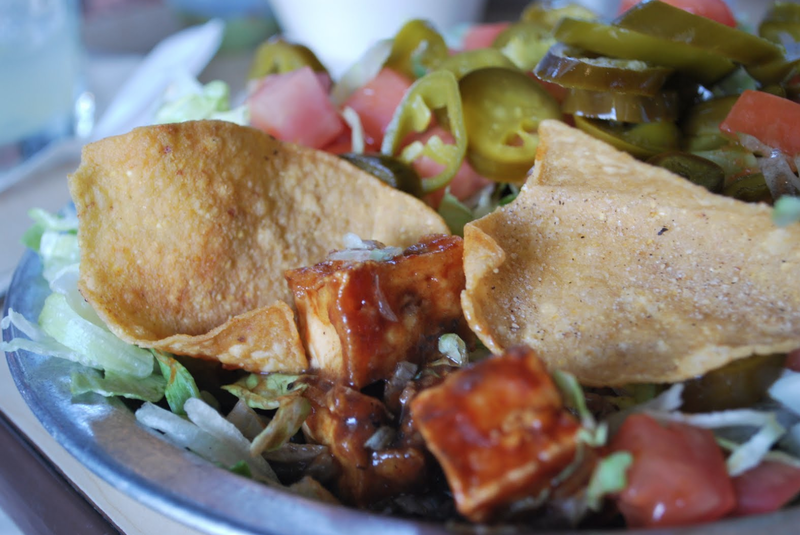 We get our chips on the side and the toppings — crispy BBQ tofu, black beans, lettuce, tomato, and jalapeno are served in a separate pan. It doesn’t make for a very pretty meal that way, but it’s much easier to eat. Here’s what the nachos look like served as is (this is from an old picture I’d taken before I discovered the "chips on the side" pro tip). The game itself (and the halftime show) was probably the most boring Superbowl of all time. But at least the food was delicious!